OMA's New York office has revealed the design for its first project in Brooklyn: a pair of residential towers shaped like "a ziggurat and its inverse". OMA's towers form part of the new Greenpoint Landing development in Greenpoint – a Brooklyn neighbourhood located just north of the better-known Williamsburg. Formerly an industrial area, the area is increasingly becoming a popular hub for eateries, bars and cafes. The Greenpoint Landing scheme, which is the brainchild of developers Brookfield Properties and Park Tower Group, focuses on extending the northern parcel at Eagle Street and Dupont Street, and forms part of the area's transformation. The project involves updating the curved waterfront into a series of blocks, following a masterplan developed by local firm Handel Architects. 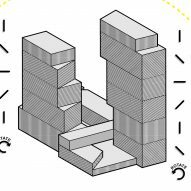 Towers are "calibrated to one another"
Led by OMA partner Jason Long, the New York office's project focuses on the Block D portion, and features two rental housing towers of different heights. The taller tower has a stepped underside so that it widens towards the top, while its shorter partner staggers inwards. Rising side by side, the structures look as if they could have been one volume that was broken in two. 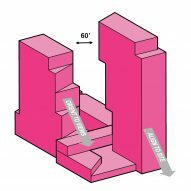 "We have designed two towers — a ziggurat and its inverse — carefully calibrated to one another," said Long in a project statement. The gap between will measure 60 feet (18 metres) wide – equivalent to the size of a narrow street – to maintain a views of Manhattan across the East River, as well as the surroundings. "Defined by the space between them, they frame a new view of Greenpoint and new vista from the neighbourhood," Long added. OMA likens the pair – which comprise the 400-foot-high (123-metre) south tower and a 300-foot-high (91-metre) north tower – to two dancers. 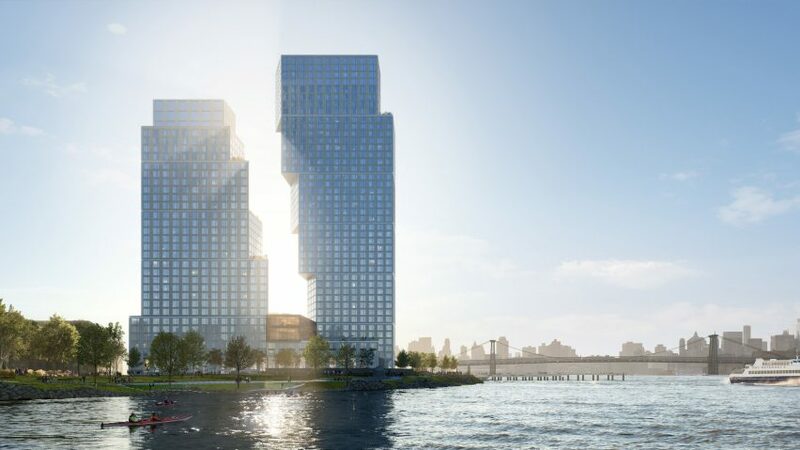 This comparison chimes with the description that Danish architect Bjarke Ingels gave his firm's The XI towers, which are nearing completion over in Manhattan's Chelsea neighbourhood. To achieve the staggered form of Greenpoint Landing Block D, each structure is segmented into seven- and eight-storey-high blocks – heights OMA chose to scale with the existing four- and five-storey residential buildings in Greenpoint. 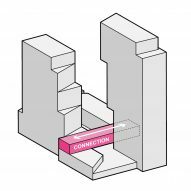 Facades of each tower will comprise precast concrete panels, punctured by large square windows to form a homogenous effect across the two. OMA intends to carve different markings across the concrete of the different segments. These "shingles" – which include diagonal, vertical and horizontal marks – will create shadowy effects to give the volumes varying grey hues. 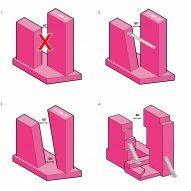 Other details of the scheme include a series of angular notches that will be cut into the ground level of the building's exterior to mark the entrances. In total, Greenpoint Landing block D will include 745 residential rental units – 30 per cent of which will be affordable. Amenities available to residents will include an indoor pool, housed in a glazed box that will connect the two structures. The rooftop will be covered in grass and feature an outdoor bathing area. Additional outdoor spaces will also be located on the grassy terraces formed by the stepped areas of the taller tower. These will correspond with a larger green space that will wrap the front of Greenpoint Landing on the waterside. Landscape architects James Corner Field Operations – the firm behind the recently opened Domino Park in Williamsburg and the elevated High Line park in Chelsea – is overseeing the design of the public space as part of the development. Long runs OMA's New York office with Japanese architect Shohei Shigematsu. The outpost is intended to function independently from the other international offices, including Rotterdam, Beijing, Hong Kong, Doha and Australia, as part of an initiative of founder Rem Koolhaas. While Greenpoint Landing Block D is OMA's first project in Brooklyn, the firm has a number of others in Manhattan. These include 121 E 22nd residential tower – the firm's first residential tower in New York – the renovation of Sotheby's Upper East Side galleries, and the addition of an iridescent glass escalator to Saks Fifth Avenue.